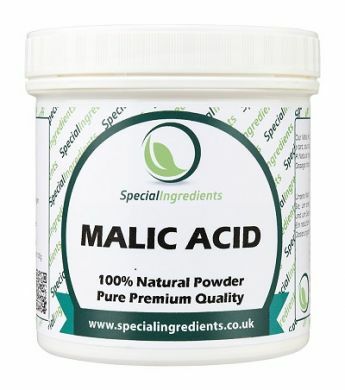 Malic Acid large pot 500g. Malic Acid is an organic compound, which is the active ingredient in many sour or tart foods. 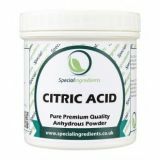 Malic Acid is more tart than either Ascorbic or Citric Acid. 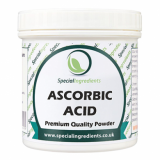 Malic Acid is a tart-tasting acid and is used to enhance flavour profiles. It is a natural substance which is found in fruits and vegetables, most commonly associated with apples. Ideal for wine making/home brewing. 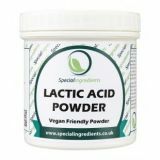 The body produces Malic Acid when it converts carbohydrates into energy. Taking it as a supplement is beneficial for conditions such as Fibromyalgia and Chronic Fatigue Syndrome. It can also help with oral hygiene. Use as required by recipe.